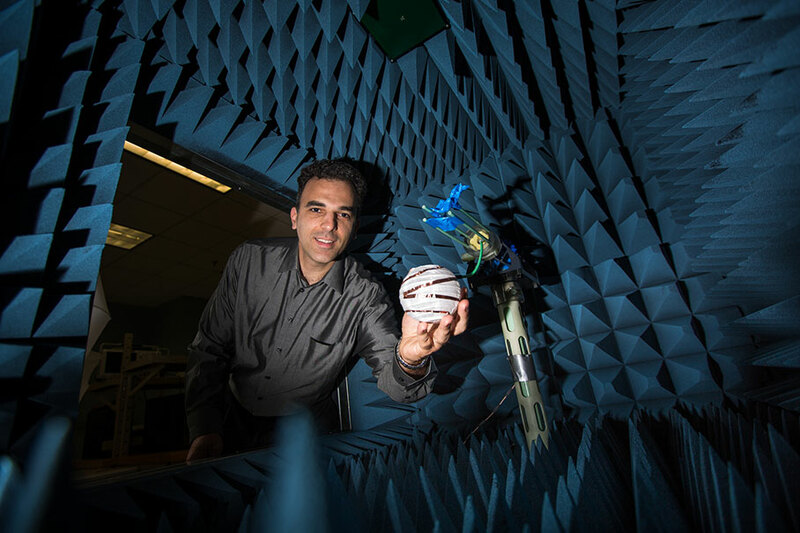 In January 2014, the Department of Electrical and Computer Engineering announced that a National Science Foundation grant would be supporting a collaborative research effort between FIU researcher Stavros Georgakopoulos and Georgia Tech University to work on the development of unique antennas using classic origami techniques. Professor Stavros Georgakopoulos shows how researchers are bringing age-old origami techniques to 21st century space. One year later, Georgakopoulos’s origami antennas have evolved out of the pockets of soldiers and into cockpits of shuttles planning to launch in to outer space, a development he will be sharing with his distinguished colleagues at the Second Annual Workshop on Origami Design for Integration of Self-Assembling Systems for Engineering Innovation (ODISSEI). The two-day event, which is presented by the university’s Division of Research, gathered together origami engineering experts from academia, industry and government, including Harvard, Massachusetts Institute of Technology and California Institute of Technology to the FIU campus Jan. 22-23. Keynote speakers were Sohi Rastegar, director of the National Science Foundation’s Office of Emerging Frontiers in Research and Innovation (EFRI), and Col. Robert Kraus, director, Basic Research Division, Air Force Research Laboratory (AFRL)/Air Force Office of Scientific Research (AFOSR). “This is a great experience and it’s a great collaboration,” Kraus says. “To get this group of people together from all of the different funding agencies, the different people who work together and the different universities, and to share and collaborate the ideas results in this cross pollenization of ideas. Workshops like this are wonderful.” The ODISSEI program is funded by the NSF/EFRI; a number of conference projects were co-funded by AFOSR. For space in particular, an origami antenna will be able to solve the traditional launch and carry problems associated with most shuttles. This means the antenna will be as small as possible during launch and open up to be as large as needed after it is released in space. Origami is based on folding and unfolding. This is an important characteristic when thinking of the multifunctional uses of an antenna in space. “This gives us the ability to design reconfigurable antennas. Not only can we open one antenna, but once it is out in space, it can fold and unfold to reconfigure itself to change shape and function,” Georgakopoulos says. Instead of having a one dimensional antenna, this version can dynamically change shape to serve different purposes. It is no longer just an antenna, but an entire radio frequency system that can fold and unfold. Georgakopoulos and his research team continue to collaborate with mathematicians and artists all over the world. They have just started to scratch the surface of origami design possibilities. Art is the ultimate form of creativity, and engineering is more of a traditional knowledge of knowing and applying. By blending the two, researchers are creating a new model of art and science.